Seattle and the adjoining metropolitan area, population 3.3 million, is not prepared for natural disasters. So when a couple of inches of snow hit King County at 4:30pm on a sleepy Wednesday afternoon, our clogged transportation system went into cardiac arrest. Like any good solider, I left work at 5:00pm. Just ten blocks from work at 5:50pm, I dug in for the journey of a lifetime. The twenty-eight mile ride home took just under five hours and fifteen minutes. Road closures, an inch of ice, jack-knifed semis, cars sliding into ditches, buses with school children stranded along the highway, chain reaction accidents, several hundred cars abandoned --- some right in the middle of the freeway, hardy pioneers walking home from their abandoned cars in shorts, you name it, I saw it. We didn't get cheated at my house. There's a good nine to twelve inches of snow here. Now that I finished eating dinner at 10:57pm, it is time to go outside, and shovel some snow. Unbelievable Kevin - glad you made it home safe and sound! I drove home in 40 degree weather, then took a walk in a slight mist, with no snow on the ground. Who would have believed I'm the guy in Wisconsin and you're the guy in WA! you've got the patience of a saint. at the 5th block, I would have pulled over, bailed out of the car, and went looking for a bar to hang out in. Anybody driving north, east or south ran into lots of driving fun on Wednesday evening. I think I tried all of those directions when finding a way to get home! 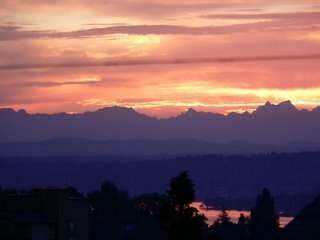 Global warming --- relevant everywhere but King County on Wednesday evening.